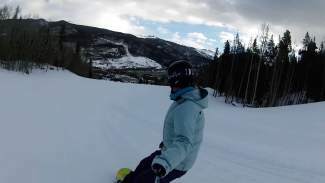 VIDEO: Summit Daily News copy editor Heather Jarvis cruises on some soft snow while waiting for the rain. 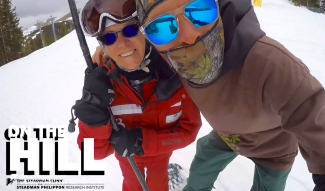 Keystone Resort: Reporting 0″ of new snow in the last 24, 0″ in the last 48 hours, 4″ in the last 7 days, packed powder conditions and a 64″ base. Explore Summit field report: The coulds are starting to roll in, but the snow is soft, and the mountain is nice and empty. Weather: 22 degrees at 9 a.m., feels warm out, should get cloudier as the day goes on. Liftline status: No line, mountain is empty. Snowcast: NOAA is calling for a 50 percent chance of showers and thunderstorms, mainly after 3 p.m. Partly sunny, with a high near 45. Breezy, with a west soutwest wind 9 to 15 mph, with gusts as high as 24 mph.